It’s getting chilly and the nights are drawing in. Pumpkin Patch Pete and Pumpkin Patch Polly are hard at work keeping an eye on this year’s harvest. 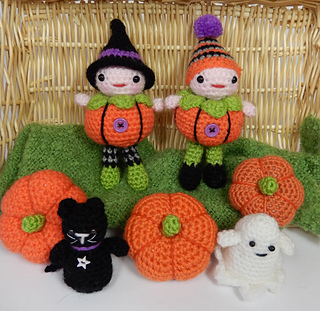 As most of their pumpkin crop will be destined to be used for Halloween parties their little black cat and ghost friends have come to help them too! 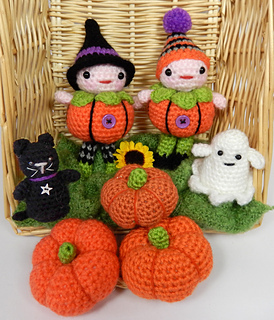 Pattern includes instructions for all four characters and can also be used to make a whole crop of pumpkins that will look good in any Fall decorating scheme. 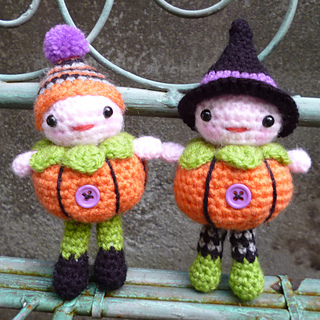 A fun pattern for Halloween fans, Fall party favors, trick or treat gifts, etc. Use for home decor or as toys for your little ones. This pattern is written in American crochet terminology and includes a handy stitch conversion chart so you can translate to British crochet terms instead should you wish to.